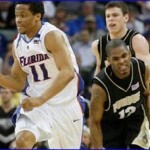 1 » Florida Gators center Kenny Kadji, who logged 45 total minutes of game time in 2009-10 before ending his season due to a nagging back injury, has been granted a medical redshirt by the NCAA, according to the University of Florida. This exemption will allow Kadji to enter the 2010-11 season as a redshirt sophomore, giving him three additional years of eligibility with the Gators. Kadji had back surgery in February to repair a bulging disk; the procedure was similar to what former Florida forward Adrian Moss had done in 2005. Reports are that Kadji has healed nicely from the surgery; if healthy, he will likely be redshirt senior center Vernon Macklin‘s primary back-up next season. 2 » Though he is now a free agent who can sign with any team in the NBA, former Gators forward/center David Lee loved his time with the New York Knicks and hopes to remain with the franchise next year. “This is where I want to be,” Lee told New York Post. “I enjoy it here. I love the city. I have a lot of friends in the franchise. I do have ties here. They say the two hardest things to deal with [in New York] are the media and the fans, but I’ve found that to be the exact opposite. Having a following here is gonna make the Knicks want to sign me more and makes me want to be in New York.” The Knicks hope to make a splash by signing two maximum contract free agents beginning on July 1, which may leave Lee by the wayside. However, New York fans and the team’s front office both love Lee, who averaged 20.2 points and 11.7 rebounds in 2009-10, and there is certainly a chance that he can get his wish to remain with the franchise. Thanks Adam. I enjoy reading the updates on OGGOA. Let’s hope Tyus stays for his Sr year!